www.rockproducts.com ROCK products • November 2018 • 17 Columbia-Jefferson City, Kansas City, St. Louis and Springfield areas. Twenty-four percent of major locally and state-maintained roads in Missouri are in poor condition and 28 percent are in mediocre condition. Nineteen percent are in fair condition and the remaining 29 percent are in good condition. Driving on rough roads costs the state's motorists a total of $3 billion each year in extra vehicle operating costs, includ- ing accelerated vehicle depreciation, additional repair costs, and increased fuel consumption and tire wear. 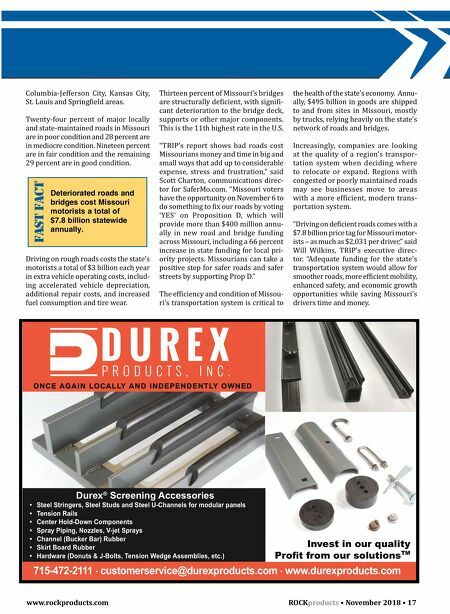 Thirteen percent of Missouri's bridges are structurally deficient, with signifi- cant deterioration to the bridge deck, supports or other major components. This is the 11th highest rate in the U.S. "TRIP's report shows bad roads cost Missourians money and time in big and small ways that add up to considerable expense, stress and frustration," said Scott Charton, communications direc- tor for SaferMo.com. "Missouri voters have the opportunity on November 6 to do something to fix our roads by voting 'YES' on Proposition D, which will provide more than $400 million annu- ally in new road and bridge funding across Missouri, including a 66 percent increase in state funding for local pri- ority projects. Missourians can take a positive step for safer roads and safer streets by supporting Prop D." The efficiency and condition of Missou- ri's transportation system is critical to the health of the state's economy. Annu- ally, $495 billion in goods are shipped to and from sites in Missouri, mostly by trucks, relying heavily on the state's network of roads and bridges. Increasingly, companies are looking at the quality of a region's transpor- tation system when deciding where to relocate or expand. Regions with congested or poorly maintained roads may see businesses move to areas with a more efficient, modern trans- portation system. 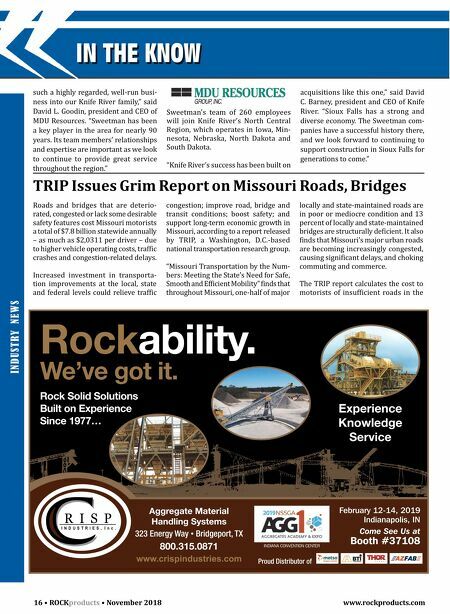 "Driving on deficient roads comes with a $7.8 billion price tag for Missouri motor- ists – as much as $2,031 per driver," said Will Wilkins, TRIP's executive direc- tor. "Adequate funding for the state's transportation system would allow for smoother roads, more efficient mobility, enhanced safety, and economic growth opportunities while saving Missouri's drivers time and money. once again locally and independently owned Durex ® Screening Accessories • Steel Stringers, Steel Studs and Steel U-Channels for modular panels • Tension Rails • Center Hold-Down Components • Spray Piping, Nozzles, V-jet Sprays • Channel (Bucker Bar) Rubber • Skirt Board Rubber • Hardware (Donuts & J-Bolts, Tension Wedge Assemblies, etc.) 715-472-2111 ∙ customerservice@durexproducts.com ∙ www.durexproducts.com Invest in our quality Profit from our solutions TM FAST FACT Deteriorated roads and bridges cost Missouri motorists a total of $7.8 billion statewide annually.